Home to six of the ten tallest buildings in the U.S., with a seventh on the way, New York City’s architecture is perhaps its most defining quality. However, even more interesting than the grandiose towers for which the City is famous, are the little-known, yet eye-catchingly strange structures dispersed throughout its side streets. 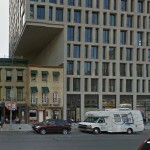 Last month, Revaluate profiled five of these crazy buildings, and here we continue with five more. 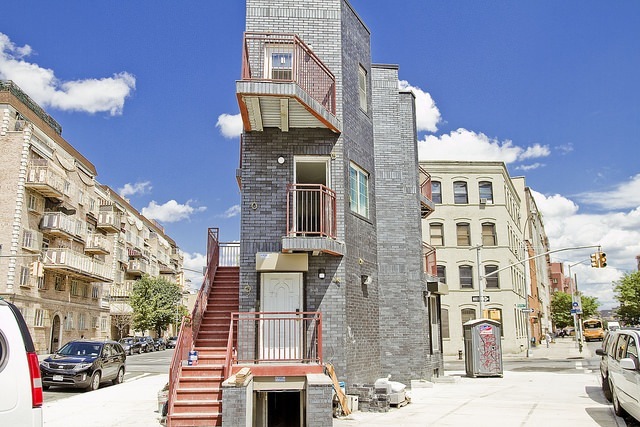 From “vertical lofts” with odd little windows to disjointed homes where nothing is where it is supposed to be, these structures are without a doubt five of the strangest buildings in NYC. What do a notorious gangster, a case of poisoned wine, an extensive counterfeiting ring, and a bizarre medical malpractice case all have in common? Word has it that all of the above have an association with the $10.3 million townhouse at 168 Thompson Street in Manhattan (currently listed by Douglas Elliman). Formerly a three story old tenement in Greenwich Village just north of Houston Street, this strange property has a design that is at odds with the brick buildings that surround it. The structure has just undergone the architectural equivalent of reconstructive surgery, adding two additional floors and completely transforming its historic exterior. Work began in 2010 to convert the old brick facade into a striking arrangement of metal and oversized glass panels, balconies and decks, designed by Douglas Gauthier of MoMA prefab house fame. Located within the South Village Historical District, the property’s distinctly modern edge is in stark contrast to its historic neighbors. Known for its traditional townhomes on quiet streets and welcoming neighborhood bar scene, the last thing you would expect in Turtle Bay is a stand-out postmodern architectural home among the more classic structures. 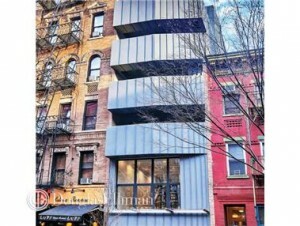 But the townhome at 324 East 51st Street between First and Second Avenues is exactly that. 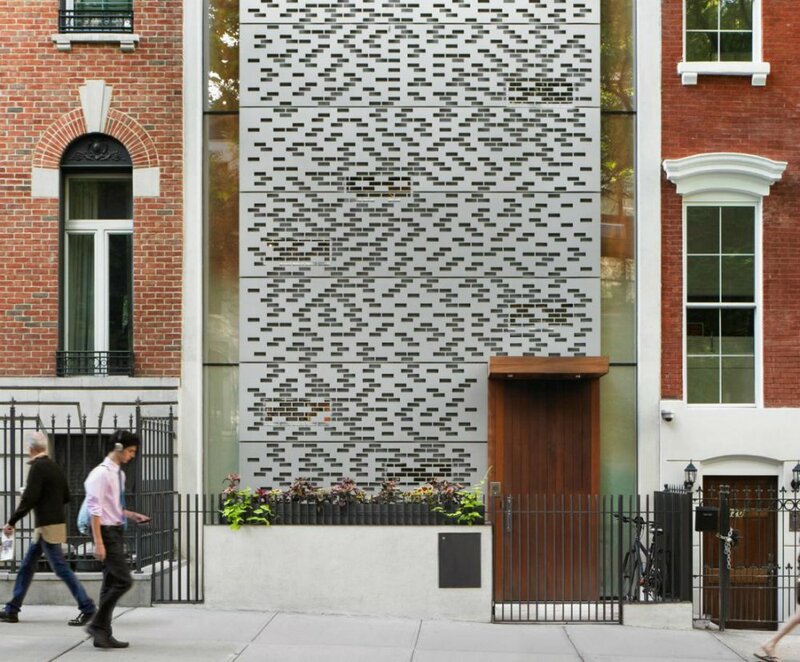 The first thing you notice about this startlingly strange single-family townhouse is the perforated aluminum facade with rectangular glass cutouts that invite you to peer inside. Alas, when you do sneak a peek, you are greeted with a look at a towering four-story bookcase housing a library of art books. Dubbed a “vertical loft” by its architects that attempts to reinvent urban townhouse design by maximizing living space on a narrow lot, the building’s cutouts are intended to admit natural light while providing privacy for the residents. This solution may be strange, but not unique. The brick-shaped cutouts that are intended to reference, not mimic the brick of adjoining homes are reminiscent of the hotel/condo building Cassa NY on West 45th Street and Fifth Avenue. 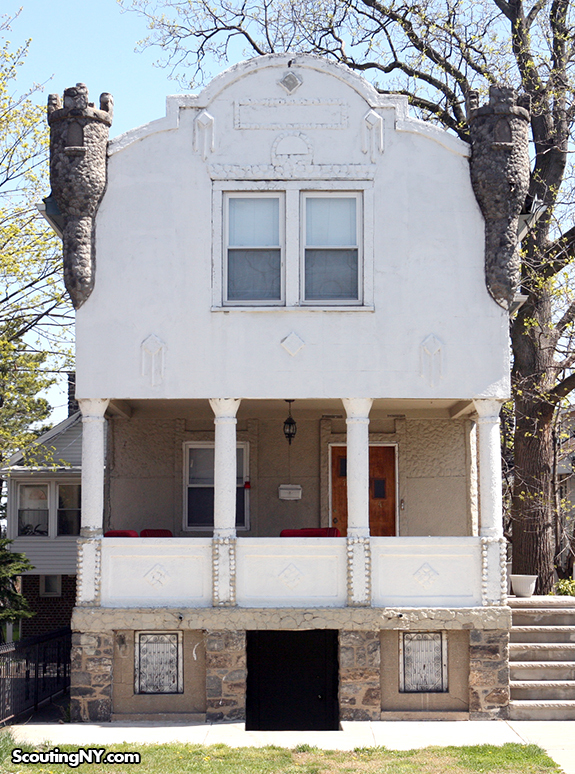 Not to be outdone by the borough of Manhattan, the Bronx enters the challenge for the strangest building in NYC with a mind-boggling structure at 426 Saint Lawrence Ave. Just when you think you have seen it all, along comes this house that looks as if it were put together by a child playing with the pieces of a residence. A closer look reveals a wooden structure with all the right elements, assembled in entirely the wrong order. The main entrance into the home is through a tall, sharply angled triangle, which seems to have been a gabled pitched roof in a former life. The chimney protruding from the left side indicates that this odd-shaped space may be the location of the home’s kitchen. A large adjoining section appears to house the bedrooms, with an interesting twist. While the roof is high, suggesting soaring interior ceilings, the rather small windows are placed just below the roofline. To peer out the windows, residents most certainly would have to be inventive. A trampoline, perhaps? The main section of the house is abruptly lopped off half-way through. Developers leave no stone unturned when it comes to building residential real estate in Williamsburg, Brooklyn. Traditionally an orthodox Jewish, black, Polish, and Latino enclave, in recent years Williamsburg has transformed into a trendy neighborhood with a vibrant music and arts scene, outstanding restaurants, and eclectic shopping. As a result, Williamsburg has become a magnet for the young and the hip, as well as the escalating real estate values that follow. Since 2014, home prices in Williamsburg have nearly tripled! This fact brings us to the crazy, narrow little home on 6 Heyward Street that sprang up on a tiny wedge of land last year. This two-family home, not much wider than its entrance doorway, just goes to show how valuable Williamsburg real estate has become. It would be a shame to waste this prime, if minuscule, space, right? There is no denying that everyone considers his home to be his castle, but some people carry this theme a bit too far. Also in the Bronx, this surprising – some would say weird – little home lives in the Country Club neighborhood, the mixed income community of upper middle class and affluent residents. 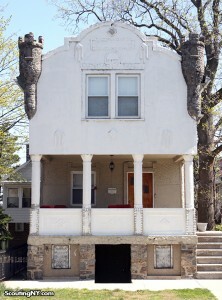 Situated on a quiet side street, this modest white home at 718 Clarence Ave has some fairly common features like a nice front porch, decorative columns and a fenced-in yard, along with some interesting and somewhat strange details. Every corner of the house, front and back, features diminutive medieval stone turrets that make the home look like a miniature castle wannabe. Round windows on the side sport a stained glass looking material to go along with the castle theme. Even the garage is adorned with turrets. Revaluate is a new kind of online review site. Before you move, Revaluate. Who hasn’t wanted to live in a castle? I like having turrets on a house, I think they are cool and would make great reading nooks. However, the turrets on the 718 Clarence Ave house kind of look like horns. The rest of the house looks great, though. 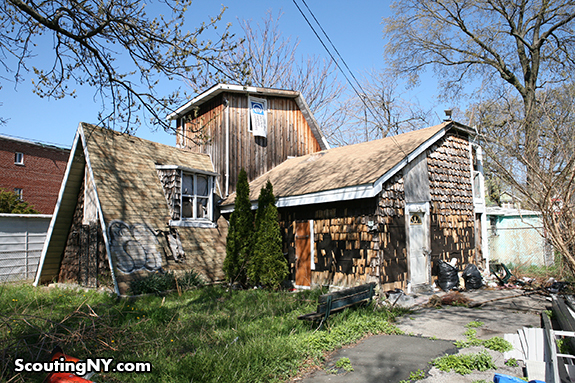 Thanks for sharing all of these cool houses from New York. Next story Epic Winter Storm & #ICNY Simultaneously Descend on City: Coincidence? We Think Not. Previous story Social Powerhouse Laurie Weston Davis Joins Revaluate!